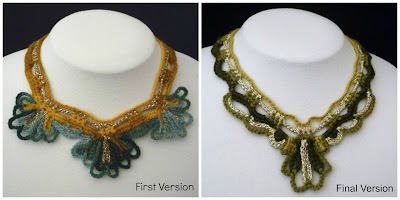 I had a chance to review the sales in my online patterns stores, and found that the Crawford Necklace pattern has been my overall best selling design. This makes me quite happy, especially since this design evolved over many, many, trial samples. Each time I made a sample, I altered the scallops and chain loops a little, and every time I began making a new sample I was convinced that it would be the last! I had to take a break from it and come back again to look at it with fresh eyes, to be able to decide that it was actually done! This is something I struggle with, I have a hard time letting go of designs. I always feel there is something more I can do to try to make the design perfect. Sometimes I even block things more than once to get them take to the exact shape I want. Jewelry pieces may be small designs, but that doesn't mean they take less time or thought than something larger! The evolution of a design is an interesting process, full of trials and tribulations, and when the design is finally completed, you have the most amazing sense of accomplishment. The ultimate reward is when crocheters like your pattern enough to purchase it! 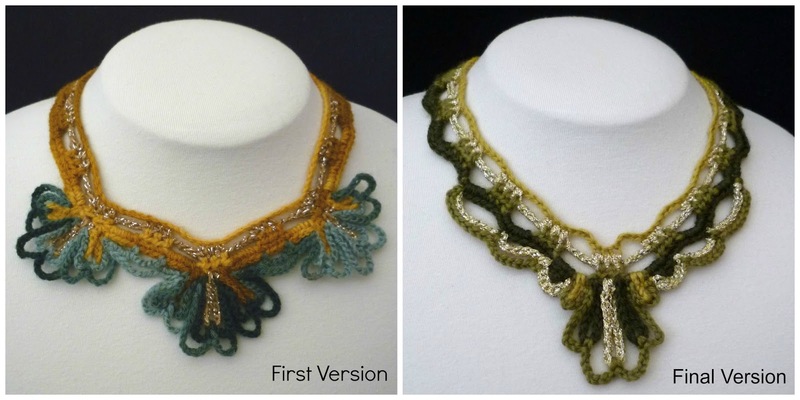 I am having problems following the pattern for the Crawford Necklace from "Inside Crochet " magazine issue 15. Have there been any errors published in the magazine that I have missed ? Hello anonymous, sorry you are having problems with the pattern. There is no errata for the pattern. I believe the most challenging thing in the pattern is the color changes. I haven't had anyone else say they had a problem with the pattern, but a few decided to drop the color changes and use a variegated yarn instead to simplify it. If you send me an email at stitchstory@yahoo.com, or your Ravelry ID, I can send you a copy of the pattern that I am currently selling. It is in US terms but it may be more detailed since it wasn't edited for the magazine, and it may make the pattern easier to understand.